They’re used to bringing warmth into people’s homes, but staff at Fire Surround Centres in Dundee will really be feeling the heat this weekend (Saturday 26 January 2019) when they take on a firewalk for charity. The family firm has partnered with Sense Scotland, who provide services for disabled children and adults in Dundee and beyond, with a 15-strong team of staff, friends and family vowing to walk 20 feet over coals heated to 1236 degrees Fahrenheit. 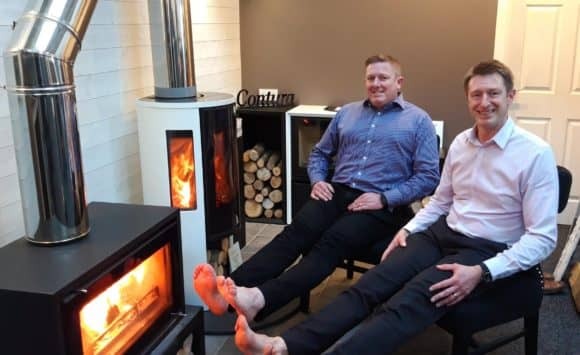 Fire Surround Centres, rather aptly located on the city’s Ash Street, is run by brothers Gary and Graeme Turnbull, both of whom will be toasting their tootsies on the hot coals. Gary said, “As a family firm marking our 50th year in business, we were eager to give something back to the community which has supported us throughout the five decades. Never ones to shy away from a challenge, we thought a firewalk would be a more than appropriate event to help us support a number of charities. “We’re delighted to be teaming up with Sense Scotland, which does some amazing work right here in the city, and we’ll also be raising funds for two charities which are close to our hearts, Alzheimer Scotland and Beat SCAD. Our father, Bob Turnbull, who started Fire Surround Centres in 1969, was diagnosed with dementia when he was 62 and my wife Kirsty was diagnosed with SCAD in 2013, which caused her to have two rare types of heart attack. We genuinely wouldn’t have got through these life-changing events without these charities so it’s time for us to give back and support them, and other families affected by these conditions. Annemarie Devlin, Head of Fundraising, Sense Scotland added, “We work with a number of families in Dundee and we are delighted that a family firm like Fire Surround Centres is marking a milestone in business by undertaking the challenge with us. In their line of business they’ll be used to the heat, but this is turning it up a few degrees. There are still a few places left for this event. Anyone with a ‘burning’ desire to take on this challenge should contact Sense Scotland’s fundraising team on fundraising@sensescotland.org.uk or call 0300 330 9292. The firewalk takes place at Dundee and Angus Chamber of Commerce, City Quay on Saturday, January 26th from 5pm. To donate to Sense Scotland see: https://www.justgiving.com/sensescot/donate. Gary and Graeme, family members and other colleagues from Fire Surround Centres will be taking part. See their sponsorship page at: https://www.justgiving.com/teams/FSC1. For more information, contact Claire Grainger, Grainger Public Relations, 07912 324 264 or Sally Hall, Communications Manager, Sense Scotland, 0300 330 9292. Sense Scotland is a charity which supports and promotes the interests of children, young people and adults who have communication support needs arising from a range of disabilities including, but not limited to, deafblindness, sensory impairment, learning or physical disability and autism.